Aero Snap is a new feature in Windows 7. It makes the windows to automatically snap to the screen edges when you drag it to the edges of the screen. For example, when you drag it to the right edge, it sizes itself to fill half the screen, when dragged to the top, it maximizes to fill the screen and so on. While this is a great feature but many people would prefer that the window retains the original size instead of snapping around the edges and resizing. For them, here’s a quick tip to disable Aero Snap and handle windows the old-fashioned way. First, click on Start, select Control Panel and then click on the Ease of Access Center. Now, click on Make the Mouse Easier to Use. 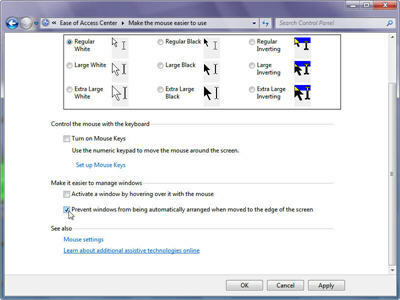 Select “Prevent Windows From Being Automatically Arranged When Moved To The Edge Of The Screen” check box and click OK.